Just 10 Minutes from Haluoleo Airport and 20 minutes to Kendari downtown, Wonua Monapa Hotel Resort Kendari has the largest outdoor swimming pool in Kendari. Not only is it also available car ATV play areas, and mini scoter, Free hotspot WIi-Fi facility provided in the rooms and public areas. Room features a flat-screen TV, mini bar and tea / coffee making facilities. A star-rated business hotel in Kendari City, Southeast Sulawesi, trusted by thousands of guests and visitors as one of the business hotels capable of providing maximum service to its guests. Friendly service equivalent to international hotels, delivering a pleasant stay in a modern hotel equipped with adequate facilities. 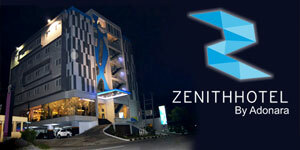 Our hotel is located in downtown kendari, close to government offices and shopping malls. Situated in the heart of the Wakatobi region you can't get better than Patuno Resort Wakatobi. This beautifully designed Wakatobi resort offers the perfect get away or romantic retreat and appeals to divers and non-divers, international guests and Indonesian guests alike. Whether you are looking for a busy activities packed holiday, or a quite place to kick back and relax, Patuno Resort Wakatobi is the perfect choice. 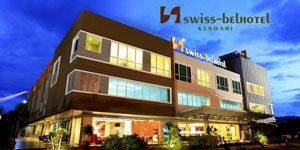 We are the finest boutique hotel in Kendari, a four-star outfit that blends the warmth of home with the Swiss-Belhotel International brand of service. Ideally located 30 minutes from Haluoleo airport, we are mere minutes away from the city center. Offering guest rooms in six different types: superior, deluxe, grand deluxe, junior suite, executive suite and presidential suite. All rooms are elegantly designed and well appointed with a host of modern amenities to make your stay in Kendari a comfortable one. Luxuriate with unobstructed views of the sea—a wonder to wake up to every morning!